As you may know, exchange traded funds (ETFs) exist for our big indexes the S&P500 (ETF symbol: SPY) and the Russell2000 Index (ETF symbol: IWM). If we believe that both will fall and we want to do a call spread strategy to bet that each won’t go above a certain level — but we only have limited capital, which ETF should we execute the short call spread on — given that we believe each will fall with the same probability and by the same percentage amount? Well, to figure that out, we would want to know what is the max profit we can get —the net credit received — from the trade compared to how much margin we need to put up. To demonstrate, we have below screenshots from the mobile app trade screen where we can see how much extra margin this trade would take at the bottom — circled below. What does this mean and how is it calculated? It means that your account needs to have $4,500 in there in order to execute this trade. If the trade works out (expires below our strike price of $210 SPY by expiration) — then we get to keep that $825. Since we required $4,500 to do this trade and we received $825 in a successful trade, then the return on margin is simply $825 / $4,500 = 18.33% (close to 20%) return on margin. So if SPY gives us an 18.33% return on margin, then what is the return on capital? Typical margin accounts give you a 2:1 leverage, so that $4,500 that we put up before? Well, actually, that’s effectively $2,250 of our actual cash. So the return on capital calculation is actually $825 / $2,250 = 36.67% return on capital. That’s a pretty healthy return on capital. It means that your trading account needs $350 in margin for each pair of call spread contracts you intend to trade — each one giving you $42. If you had 10 call spreads, that would require $3,500 in margin and give you a potential credit of $420. Return on capital (assuming a typical 2:1 leveraged margin account) would calculate based off of half the margin — so half of $350 = $175. And the profit divided by capital would be $42 / $175 = 24% return on capital. 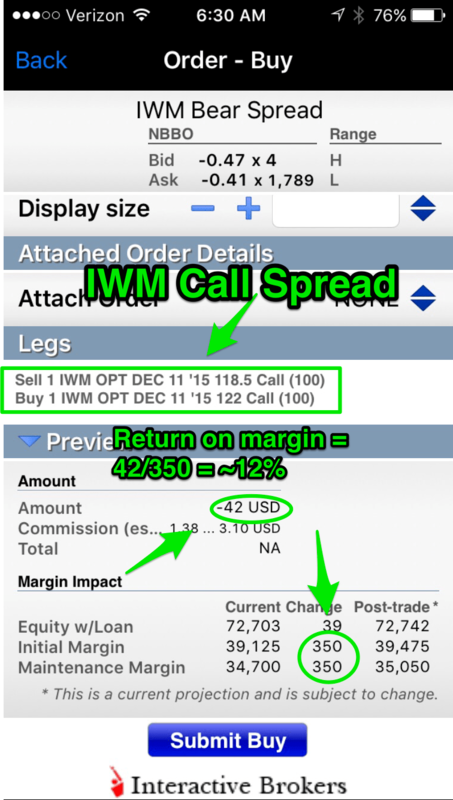 While these are not exactly perfect apples to apples comparisons –the general idea is that the return on margin for a call spread trade on SPY is a bit more efficient (20% return on margin) than the same trade on IWM (12% return on margin). So if you are running low on margin and you have believe you have equal probability of success on betting that the IWM won’t go above a certain point and SPY won’t go above a certain comparable point, then it is generally a smarter use of your margin to choose the SPY trade over the IWM trade. But you believe IWM has a higher probability of staying below the short strike than the corresponding SPY — then you should trade the IWM — always focus on higher probability first. Previous post Friday, December 4, 2015: SPY closed below 210 at 209.62 – Realized $2,600 Next post December 7, 2015: Still can make $1,960 on this week’s trade!